FILE - An Afghan policeman inspects a building used by insurgents after an operation near the Indian consulate in Mazar-i-Sharif, Afghanistan, Jan. 5, 2016. Afghan security forces backed by U.S. military airstrikes have made advances in a volatile southern district, killing dozens of Taliban insurgents and wounding many others, said officials on Wednesday. The fighting in Marjah, a Taliban-held district in the restive Helmand province, erupted a day earlier when Afghan forces launched a counter-offensive to try to recapture lost territory. “We have evicted the opposition from three places (in Marjah),” Provincial police chief General Abdul Rehman Sarjang, told VOA. He said the counter-insurgency operation has also opened a main road for traffic in the area that was heavily mined by the Taliban. A U.S. military spokesman, Col. Michael Lawhorn, says its aircraft carried out a dozen strikes in Marjah on Wednesday and neighboring Sangin district in support of the ground offensive. Taliban spokesman Zabihullah Mujahid refuted claims that it suffered losses in Marjah. “The American and forces of the Kabul administration have suffered heavy losses and in order to divert public attention they are making false claims,” he told VOA. On Tuesday, the United States confirmed that one of its service members was killed and two others were wounded during the fighting. “They came under fire while conducting a train, advise and assist mission with their Afghan special operations counterparts on the ground in Marjah… We understand a number of Afghan forces were injured as well," Pentagon press secretary Peter Cook told reporters. Two helicopters were sent to provide assistance but one was waved off after taking fire and returned safely to its base while the second landed safely but sustained damage to its rotor blades after it apparently struck a wall, Cook said, adding the helicopter was still on the ground trying to retrieve the wounded U.S. personnel. “We can confirm the wounded have been evacuated,” U.S. military spokesman Col. Michael Lawhorn told VOA on Wednesday. Marjah is one of several parts of Helmand under control of the Taliban. Taliban insurgents have put pressure on the province in southern Afghanistan's poppy-growing region for months. Ten of Helmand's 14 districts either have fallen to the Taliban or have an uncertain status in the midst of fighting between the Afghan government's security forces and Taliban fighters. The insurgents' advances prompted commanders of NATO's Resolute Support mission in Afghanistan to deploy American and British military advisers last month to help Afghan forces better coordinate their efforts to re-take lost territory in Helmand, Afghanistan's largest province bordering Pakistan. 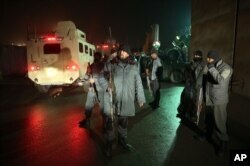 Afghan police soldiers stand guard at the site of a suicide attack near a compound belonging to foreigners in Kabul, Afghanistan, Jan. 4, 2016. According to U.N. data from October, the Taliban insurgency has spread across Afghanistan more than at any other point since 2001 and Afghan security forces have struggled to contain the insurgents. In his Tuesday briefing, Pentagon spokesman Cook would not concede that Afghan security forces are losing ground. “They're getting better at defending their own country. But they're not at a point yet where they are able to operate entirely on their own, which is why U.S. forces, other NATO forces are there, assisting and providing this kind of training and assistance to the Afghans,” said Cook. The hostilities come as Afghan, Pakistani, U.S. and Chinese officials prepare to meet in Islamabad on Monday to discuss how, where and when stalled peace talks between the Kabul government and the Taliban can be resumed. "The U.S. and Afghan governments agree that the best way to ensure lasting peace and security in Afghanistan is through an Afghan-led and Afghan-owned peace process,” Cook reiterated. Meanwhile, the United Nations has condemned a spate of bombings this week in civilian areas of Kabul by the Taliban. The UN Assistance Mission in Afghanistan (UNAMA) said in a statement Wednesday that at least five civilians were killed and 56 others wounded in the three suicide vehicle-borne improvised explosive devices attacks in the Afghan capital since the beginning of the year. The victims included ten children and nine women. “International humanitarian law explicitly prohibits attacks against civilians and requires all parties to uphold their legal obligations to at all times avoid harm to civilians,” it said, adding the attacks occurred while many Afghans held hope for the restart of a peace dialogue for Afghanistan.